Clear blue sky, sunlight and flower-scented breezes - the splendor of a summer day inspires this top, flowering branches against a celestial blue. 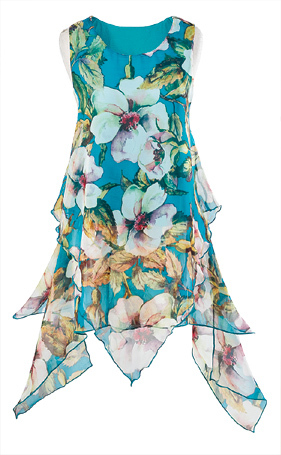 Lightweight chiffon tunic with pointed hem floats over a knit tank with chiffon hem, for layers of flutter. Approx. 40" at longest point. Imported. Polyester/ spandex; machine wash. Sizes S-XXL.